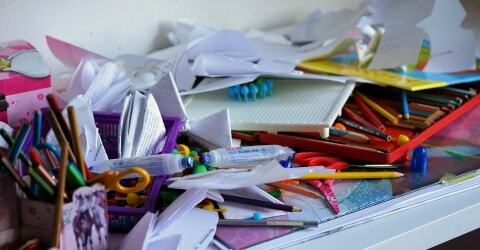 Are you struggling with clutter piles in your home that are not your own? Read these tips for what to do when the clutter in your home isn’t yours. It can be super frustrating to be staring at someone else’s clutter, especially if you have finally gotten control of your own. However, yelling, nagging, or doing something as brutal as tossing their junk in the garbage is not going to get you anywhere. All those actions are negative and thus are just going to negatively impact your relationship with the one you love. Instead be patient. Accept that the other person’s clutter is not going to disappear in one day. 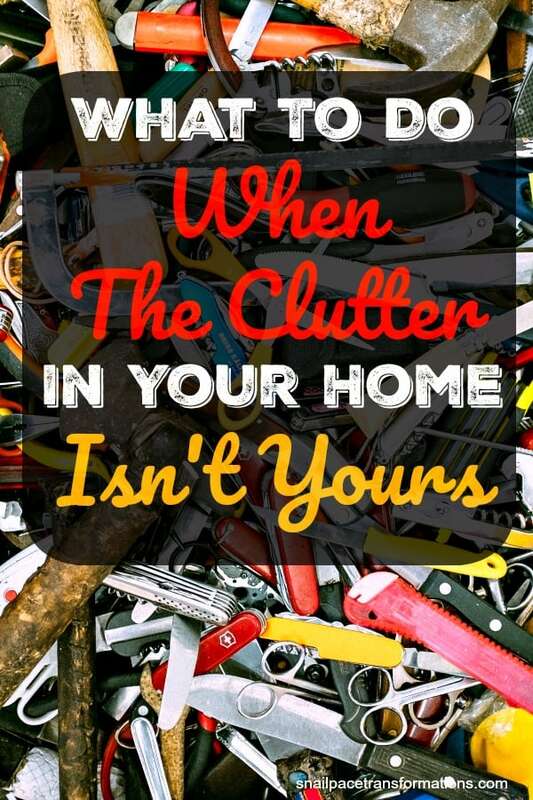 Do what you can to set a good example by keeping your clutter under control and chances are the “clutterer” is going to see the positive impacts of that on your life and eventually they are going to want to follow suit. Don’t let your resentment towards the clutter hurt your relationship with the one causing it. Be loving by choosing your words carefully when you must tell them how much it displeases you to have clutter in the home. If you must handle their clutter, don’t sort through it, just move it–and only if the owner of the clutter gives you permission. When you are able to put all anger and frustration aside ask–with love–the owner of the clutter if you could at least create some ground rules for how much space their clutter piles can take up. Perhaps a good sized basket by the front door for their keys, receipts and pocket treasures, with the rule that it has to be sorted through when it overflows? You could use this idea in the bedroom, bathroom, and other areas so they can be free to be messy in a way that looks relatively tidy. Plus when company comes, you can pick these up and put them out of view in a jiffy. Can you give them a room or shed out of the view of you and company that can be entirely devoted to whatever items they want to pile up, but can stay out of the public view? How about a plastic tote with a lid in a room or two where they can store the stuff they like to use in that room, but that can easily be lifted out of the room and put somewhere else when you want a clutter-free environment? Make it part of the deal that they have to go through the bin each time they can’t seem to close the lid on it. You can also suggest that this will be where you will toss their stuff as you clean up that room. Is there one room that you can make your clutter-free sanctuary? A place they will know is off limits for their piles. Discuss these options together and come up with a compromise to contain the clutter (rather than rid the home of it) that is livable for both of you. If these people live in the same home as you, I am going to assume it is because you love them. Always put that loving relationship before the clutter. As difficult as it may be turn a blind eye to their piles, do it as much as you can. Compromise is probably more realistic than getting that clutter-free home environment you want. Continue to set a good example by dealing with your clutter, but don’t be showy about it–let your loving actions be louder than your words. And let your words always speak that you love them more than you love the idea of a clutter-free home. Book suggestion: Decluttering at the Speed of Life: Winning Your Never-Ending Battle with Stuff. The author, Dana White, does such a good job of explaining how to best deal with other peoples clutter issues within the pages of this book.